was security obsolesed by Meltdown and Spetre memory ERROR families. These memory bleed thru leaks are caused by chip and firmware interpretations by designer's from different HW and SW domains, their assumptions were different. Throw in the "flywheel-cpu effieciy" mentality of most Engineers, a perfect anti-Ven diagram is created whose holes extend thru time and space that will always allow memory leakage under given conditions. being more optimal was a much low priority than being more secure. Here is a report of current status/efforts by Intel's Elite team. Throughout 2018, researchers inside and outside Intel continued to find exploitable weaknesses related to Meltdown and Spectre class of "speculative execution" vulnerabilities. Fixing many of them takes not just software patches, but conceptually rethinking how processors are made. From a report: At the center of these efforts for Intel is STORM, the company's strategic offensive research and mitigation group, a team of hackers from around the world tasked with heading off next-generation security threats. Reacting to speculative execution vulnerabilities in particular has taken extensive collaboration among product development teams, legacy architecture groups, outreach and communications departments to coordinate response, and security-focused research groups at Intel. STORM has been at the heart of the technical side. "With Meltdown and Spectre we were very aggressive with how we approached this problem," says Dhinesh Manoharan, who heads Intel's offensive security research division, which includes STORM. "The amount of products that we needed to deal with and address and the pace in which we did this -- we set a really high bar." Distributed Security Architecture (DSA) that uses Multiple groups of three CPUs with a Service CPU. The fundamentals of computing are always algorithm related. using more than one CPU for most problems or applications. it is difficult to figure out how, what, or who. This is the state of most computer systems after they malfunction. require both special hardware and software, usually beyond most user capabilities. if true Parallel benefits are to be achieved. The AOS Solution: An Algorithm O/S or "Algorithm Operating System"
in almost all designs can be mapped directly to a three CPU implementation. The three dedicated CPU types are the Input, Processing and Output CPU. Expansion is then a times three manner; ie. 6,9,12,15 CPUs. The local O/S is downloaded along with the application from your own library copy. of the system in real time. A JOB will not run in an unverified environment. The Input CPU is dedicated to handling interrupts and data streams. loop scanners get, copy, and process the data in real time. that can immediately process and verify data as soon as it is available. O/S interaction is very limited or needed. that scans for any work available. Again little O/S interaction is needed. there is no real Software [SW] able to use them in any CONSUMER noticeable way. This design allows a new algorithm paradigm with many unique scalable features and powers. The 1+3*5 design heralds a new era of system reliability and Reach; all with inherent security and integrity. of efficiency to insure a reliable outcome every time. Mostly idle CPU's are the norm in today's power hungry and costly server centers. the best way to partition a sixteen CPU system; sixteen being the local geometry optimum core count. with a literal name of 1+3*5 for the 16 CPU's. The '1+3*5' is a very patentable design, as well as its literal numeric logo, being a natural Trademark. Each of the 5 possible Nodes has 3 CPU's, that are shared among an active JOB(s). making several Secure authoritative modes possible! The Service Computer, the one of 1+3*5, provides interrupt and I/O services for all CPU's. and is complete for most Medium to Higher levels. too slow, size problems, and major cost and schedule overruns! The "Mythical Man-month" is alive and well. and illustrates why new types of Software Systems had large Impractical Cost and Time estimates! Newly available 2^64 Address offers over four billion times more reach. to uniquely define and divide the loads or suffer some missed goals. unless the Job is locally fine-tuned to the desired state, accordingly. * FAQ3: Who is designer? A 34+ year Computer Industry Vet; Univ of IL, 1965; B.Sci. serious commercial competition and the current dead ends of uniprocessor based concepts. eg. O/S slowness and Virtual-CPU schemes! to partition tasks and reduce errors of omission, scheduling, and interference. It has internal audit logs that insure adequate recovery, this is Posopip's bonus to its users. Imagine nothing between you and your Data. 1 - Using a 4 CPU base system The 1+3*5 class O/S is system is developed and tested off-online ; while its Ideas and algorithms are being PATENTED . with a MAC/Unix legacy backbone as part of a Uni-CPU Migration foundation. Given this stable on-line base, enhancement requests, both free and paid, require staff increases. 3 - WWW.Fee-mail.org: An Ad friendly, Spam controlled network as a Future Equity product line. A firm schedule of 2.5 to 4 years , for the three phases is envisioned. My choice for CTO is available, and familiar with the design. All for a total investment of $3.6 million dollars, spread over the schedule; for a one-tenth equity stake. needing up to ten million dollars total. LEGACY API's via Unix and Apples's MAC paths of portability. The QNX system will allow most Unix/MAC applications to be ported with minimum effort. it also did not allow users to remap the memory access and protection functions. Therefore, it had eliminated itself as the SVC computer. However running Linux in a three CPU frame under 1+3*5 will be a major goal of the WEB development phase. In summary, 1+3*5 is a new way of designing algorithms that make security and accountability inherent. guaranteed results regardless of any runtime problems. The 'P' or Processing CPU runs in a non-interruptabe loop until all user defined criteria are met. while the 'OSOP' CPU regulates output and maintains the JOB flow. the 'P' CPU posts the event so the 'OSOP' CPU can either re-schedule/retry/terminate appropriately. along with its time-stamped sequence of events. allows for strict security zone adherence due to redundant copies of important functions. This forms the basis for the (DSA) Distributed Security Architecture itself. *** Worst case: the JOB times out and it is retried or reported. as its entire cost of certifying 100% delivery of its many types of cargo. which contains its own copy of the Job supervisor as its local simple O/S. The Next Version CPU algorithm design is HERE! given its unique way of using 1 plus 3 to 15 CPU cores in this three by five manner! or two litigants and a judge/arbiter. In the 1+3*5 system you can do all FIVE at once. Having an O/S with a r/t common environment, will allow a quantum leap in scope for most applications. This heralds a new era of opportunities using this CPU Trio scheme in r/t. used as a two to five seat Command & Control system in a modern Naval warship. with the ability to respond quickly to any perceived threats independent of the actions of the other seats. This design is growable in scale for more seats to control larger vessels. Another application fit would be a 4 to 5 seat Control system for a modern Commercial Airliner. 1. Pilot seat, 2. Copilot seat, 3. Navigator seat, 4. Systems/support seat and 5. An optional Mission Specialist seat. A new basis or new way to model/design Artificial Intelligence (AI) theories. many new ways to model AI goals become available. Trinary: a generic ONE plus TWO CPU template ! to add two CPUs for enhanced work load sharing. 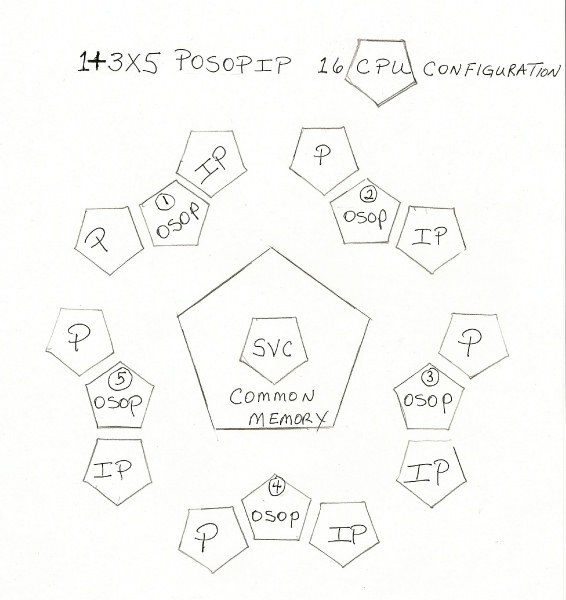 Posopip is the "default 1+ 2 CPU configuration template". and then starts the JOB by signaling the SVC CPU to allow input and output to begin. Trinary: How uni-CPU algorithms can transition to the 1+3*5 O/S ! The Trinary concept allows a uni-CPU systems to be split in two; an Input CPU and an Output CPU. while Output and its associated processing in a second CPU. and to insure the data queues between them function correctly. along with the SVC CPU's coordinated services! It would allow most uni-CPU Bound applications to at least double their throughput. This will bring more than just hobby dollars into the 1+3*5 WEB community market place. SVC CPU protocols as the basis of the 1+3*5 O/S ! in your favorite environment leaving r/t out of the mix . as this was the standard deployment of the local 16 CPU environment . There are several design features purposely omitted to enhance the over-view of 1+3*5 concepts. 1. Closing a JOB is immediate by today's desktop standards. 2. Threading is seldom needed due to dedicated CPUs. 3. There is NO virtual memory facility allowed outside of 1+3*5 rules. 4. Accurate statistics of how long programs and subroutines take to run will be available without special circumstances . 5. Each Posopip trio has Internal audit trails and redundant elements for r/t recovery options. 6. The 1+3*5 design has a Cloud like network with a IPv6 address space linking all internal and external data spaces. Windows and Linux systems to run under the 1+3*5 Architecture. will be facilitated with 1+3*5's "Trinary" syntax services . the next years will see many new multi-core systems and little SW to use them, besides the "N+1" model. with guaranteed certifiable results [legally provable via time stamped audit traces]. both for new Posopip designs and upgrading Uni-CPU bound systems with two helper CPUs. **** splitting a CPU into pieces is now obsolete, given tomorrow's abundant multi-core wholes! and its r/t network interfaces. The QNX web site. with current SMP systems that use their available CPU cores poorly. and it often sputters or worst, it stalls out fatally, often losing your setups! Fee-mail.org is the name of Mister-Computer's revenue products. to post a bond for each message that is guaranteed delivered. to the verifiable actions of the receiver. eg. 5 cents to open and 30 cents more to download/read/complete. Also, how any Fee-mail.org fees are to be shared. less the Fee-mail.org handling fee; typically 2 to 20 cents; COD's are also accommodated. must have a 75 cent or greater bond, or you never see it outside of a rejection summary log. You can also set your account to harvest the pennies of incoming pings . and setup as a current temporary Fee-mail destination with a 75 cent threshold. Fee-mail.org is composed mainly of temporary user accounts whose lives were wedded to the user's intent. Fee-mail.org protocols auto-filter out whatever the user deems unwanted; based on bonded trust. Spamming is vanquished/controlled in that one is getting paid for a voluntary transaction. ---- One can now have a real public net address free of junk mail. ---- A public address with an inherent "call screening" shield that is monetarily based! Fee-mail runs in the 1+3*5 environment under the Posopip O/S's CPU Trinary. eg. senders must buy a temporary stamp that has cash value to you the receiver. The received amount can be kept for whatever reason! Friendly parties use Rebates contained in the message acknowledgment. -----side effect: every prepaid Fee-mail.org Message gets acknowledged in a timely fashion. which are redeemable on-line in the holder's currency. Fee-mail can deliver accurate product fulfillment at a fixed cost. and a 25 cent cash reward upon returning the completed offer/survey/poll. This was an architectural system designed for users; not programmers. two workers, insuring the fidelity and independence of the solutions. is independently audited and time stamped while it loops through its cycle. shared CPU or O/S available to generate the solution. Security is compromised easily by any one or more of the cpu threads/tasks. in the noisy environment of most multi-threaded implementations. Another analogy is the reliability of a single-engine automobile vs.
an engine-per-axle implementation; especially when the vehicle is a multi-axle one. Which is more robust, able to complete the journey if engine problems developed? until the correct delivery is made or time runs out. in that, the Trinary's 3 CPUs usually mirror the boundaries of the problems being solved. No need for complex solution Algorithms that must be combined around a single point of execution. this design provides both means and avenues for one's financial dealings; via its chain of verifiable steps. experts they will consult to judge the overall design feasibility of this 16 CPU scheme. with 100% reliability to both the Designer's and User's Intent! is presented to allow a context of evaluation to those who are not familiar with such matters. Here is a minimum of what will become available for this R&D investment. 1. A fixed time schedule of five years max; with working on-line capabilities after three years or less. 2. A prototype coupon system as a working application that has the potential to earn back the initial investment. 3. A generic reliable ADVERT friendly, SPAM controlled fulfillment system using prepaid postage. 4. Bondable Security Guarantees will be available for all properly configured JOBs via a postage surcharge. 5. A generic single CPU life-cycle extender vehicle that will be marketable to an audience of presently bound systems. 6. Many new ways to design parallel applications; some will be marketable to Commercial and Military needs. ------ eg. 5 r/t seat(s) for a 5 seat Control system for a modern Commercial Airliner. ------ 1. Pilot seat, 2. Copilot seat, 3. Navigator seat, 4. Systems/support seat and 5. Spare Seat. 7. A share of the Patent, License and FEE-MAIL.ORG postage fees, based directly on a one-sixth equity stake. These fans/users will evolve into a unique new power class . in our increasingly computer literate society. This next "computer smart" audience will be hungry for select current prepaid adverts/solicitations. that earn them Credits | Bitcoins by running a local "1+3*5 Backbone Network" node in our proprietary franchise system. This WEB page address: "http://mister-computer.net/13x5/13x5sum.htm"
author: RD O'Meara Oak Park, IL. Here is my published article about the first Western Union computer network traffic generator, TPUT. Neutrino� RTOS Secure Kernel v6.4.0 has been certified to the stringent security requirements of the Common Criteria ISO/IEC 15408 Evaluation Assurance Level 4+ (EAL 4+). My interests range widely. Here are some published papers concerning my Physics & Mathematics Insights. A Monopole Aether Theory: A Classical model of the Aether based on paired Monopoles. 5SPACE : "Stable Particle Masses mapped by (N/2)^5, N=1 to 22"
both Mathematically and Physically being the Rydberg constant of 1.0973~! Primes3D: A Construction Proof of Prime Numbers having a cubic Nature. Short proof of Fermat's FLT: A proof based on power sequences infinite transcendental Logs.